The riveted range guard wall above the range takes on uncommon decorative power. For a spacious kitchen in a newly constructed Spanish country home, architect Pablo Carvajal and designer Isabel Lopez-Quesada created a stunning riveted range guard behind a white Lancanche Sully with an electric (or perhaps induction) top. But back to Spain. Here, the curved hood is considerably wider than the range and hung high. The stainless steel range guard is finished with rivets that create a decorative, industrial-look border around the sheet steel. That match riveted detailing on a more discreet stainless liner with a narrow riveted rim that finishes the bottom of the hood. The stainless steel slab also helps visually rectify the wall: on close scrutiny, the range appears to be off center. It wouldn’t have been noticeable but for the old-fashioned 4-inch black stone backsplash that rims the counter and draws the eye to its choppy contours. In a more modern kitchen this approach to a range guard might be less distinctive. In this country kitchen with a reclaimed wood-plank floor, pine farm table and coffered ceiling it makes a striking statement. It should be noted that the absence of upper cabinets maximizes this use of the wall and leaves the kitchen with an especially open, airy appearance — as well as highlighting the hood. Glass makes a practical range back too Jane, and is inexpensive. It can be painted on the reverse side, bearing in mind the glass adds a cool tint to any colour (I know because I did this for my own kitchen). Love that riveted steel range guard! It’s such a fantastic piece that works well with the enormous hood. 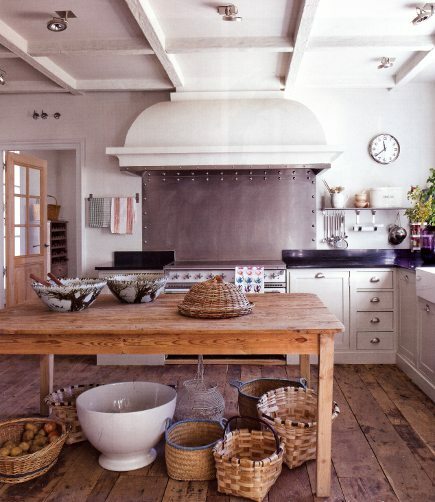 Great looking kitchen, too, though the baskets feel a bit too staged for me. I feel like I’d be constantly kicking baskets as I worked at the table. Overall, it’s another beautiful kitchen with a work table, that’ll be added to my cottage kitchen inspiration files. Thanks for sharing.